We travelled to this property with high expectations from reading the description in the brochure. The property was stunning! Fantastic views and comfortable. However - our holiday was seriously let down by the following facts : (1) The garden - which was advertised as a spot to relax in and shady - was unusable. The ground was incredibly uneven, you couldn't stand a chair on it. (2) The very steep access "track" to this property was quite scary. I did take this up with Rural Retreats and they altered their description of this on their website. The parking - for 1 car only at the top of this track was on a piece of hard standing, but with a very very tight turning circle. If you're in a 4x4 - forget it! Alternative parking was offered in the village, a 15 minute walk - and £10 a day cost! This is not acceptable. We felt all of this was such a shame, when the property was outstanding. FROM THE OWNER ~ " Thank you for your comments, we are very pleased to hear that you found the Lookout outstanding and stunning, we share you sentiments. We are sorry that you found the description of the access way misleading as we have always tried to be factual and published that the access to the house is via a steeply sloping drive so am sorry you found this difficult to use. I would also advise you that parking for a 4 by 4 is readily achievable as we drive such a car ourselves and have not found this to be an issue. Thank you for your custom and comments." Superb accommodation with fantastic views. Access is challenging – we found it best to do a 3-point turn halfway up and reverse the rest. If you have any sort of mobility problem, beware that the track to the property, especially near the road, is very steep. We had to use the car every time we wanted to go out as my wife couldn't manage it. Other than that, it's a terrific place to stay. The house itself is very comfortable and the view is spectacular. The parking was very awkward. The turning circle is extremely tight and the arrival instructions could be clearer. House dirty on arrival. Needs a paint as well. Pay for the views. Thank you for feedback. I am so sorry that you were not so happy with The Lookout and I have passed your comments on to the owner. Beautiful cottage, though access by car is tricky up a very steep narrow road. You'd struggle with a long or low vehicle. Unfortunate that the larger section of bi-folding doors were broken, but at least we could still use the deck. It would be helpful if information was given about where to find the separate utility room and freezer, as we had to phone to find out. We didn't think to look in a separate building! There was also no information about recycling, and the bin wasn't emptied when it was supposed to be. Otherwise, can't really fault it. It is out of the way, but only a short walk to local amenities. The local shop is very well stocked with essentials. The views are amazing, and it was lovely to be able to lie in bed listening to the sea. The accommodation itself could have been better from a cleanliness point of view in that the floors were dirty and the inside of the drawers were dirty. (I had to clean them upon my arrival) the second bedroom lacked drawer space for jumpers. 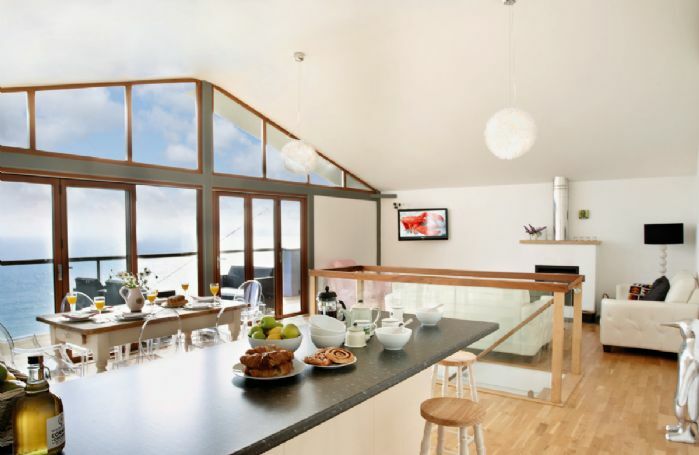 The dining area was very good with the sea views and all the kitchen equipment was exceptional. Property Excellent and well equipped; would have been better if it also had a bread bin and some air tight containers for biscuits etc. Hamper not up to RR standards. No cereals, no marmalade, and v little fruit. A very well equipped, superb property. We struggled to think of anything that was missing!! The only issue we had was with the parking. For a large car it is very difficult to turn around in the space provided and this could perhaps be made clearer in the description in the brochure. A beautiful house with a stunning view and kept spotlessly clean. The driveway was a little difficult to navigate for the faint-hearted but there was plenty of car parking a short distance away. Beautiful property but with a few minor problems shelf in fridge broken no shelves in showers and kitchen rubbish bin had not been emptied upon arrival. My main complaint would have been workmen arriving at 8.15am to fix a hinge on bi-fold doors which I had agreed to they were there for three hours having removed all of the doors(a little chilly) and trying to make breakfast was a little difficult. But a lovely house in a lovely position. Not as nice as we had expected from outside but absolutely stunning once inside and the views were wonderful. Improved parking for two cars would be much appreciated, our hire car was enormous to hold people and all our luggage from NZ. Even if it is a bit further away from the property, it would help. Really enjoyed our stay. Beautiful location, well-equipped cottage. Lookout is a contemporary split level detached house overlooking the beautiful southern Cornish coastline. Situated at the gateway to Cornwall, a mere 17 mile drive from Plymouth, Downderry is a small village and although there are few shops they do offer everything for that essential purchase. There is also good eating in 'The Blue Plate' Restaurant, Waves bar and other local pubs and restaurants. Guests can walk down to the beach which is approximately a five minute walk and is a mix of sand and shingle. 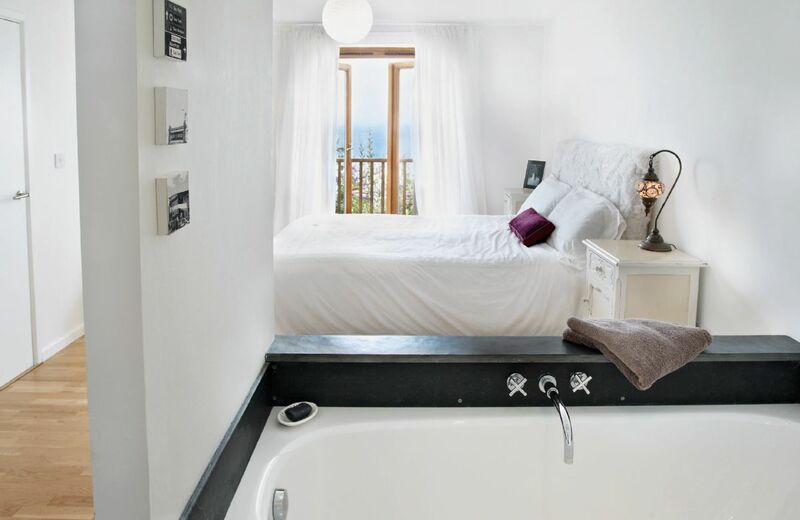 Set amongst breath-taking views, this beautiful self catering accommodation sleeps six people in three spacious bedrooms all with en-suite bathrooms. 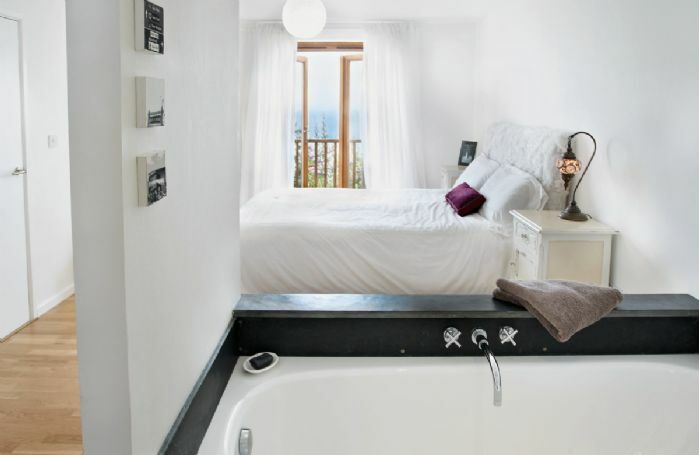 All rooms provide stunning panoramic views of the sea. The front door opens into a welcoming reception lobby leading to a cloakroom and large open plan kitchen/dining and sitting room. The seaward view spans across Rame Head to Eddystone lighthouse and Looe Island. 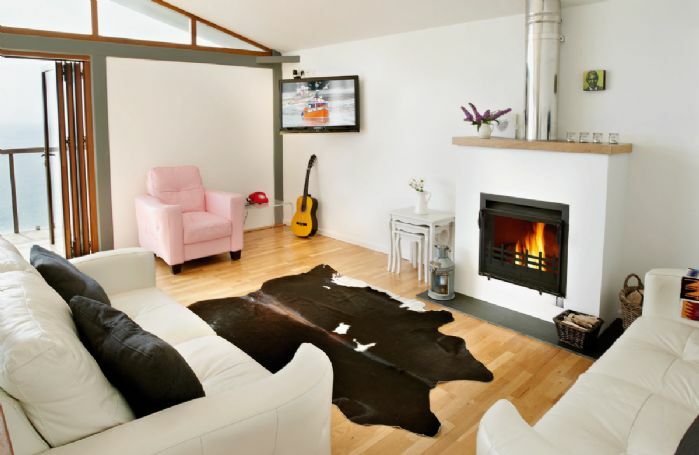 The living area is perfect for a holiday in any weather. 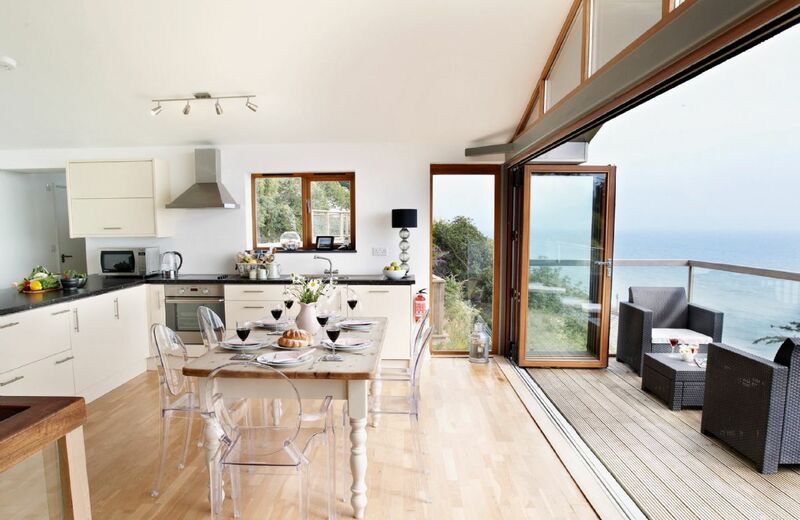 In summer, the living space can be extended to incorporate the decking and fully enjoy the view by opening the bi-folding doors. Whilst in winter, the storms can be watched rolling in across the bay, with the comfort of the open fire. A perfect retreat to suit all! The garden is a south facing sun trap with wonderful views and is terraced with steps leading down to a small lawned area. 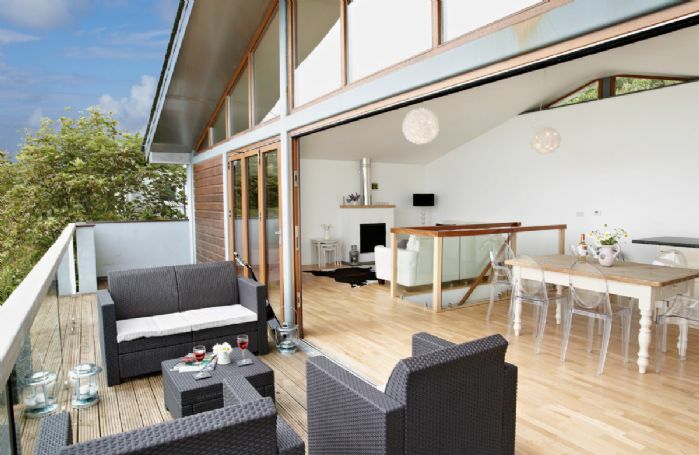 It is perfect for enjoying the natural landscape and ambience whilst listening to the sea. There are shaded areas within the garden for those who like to relax out of the direct sunlight. 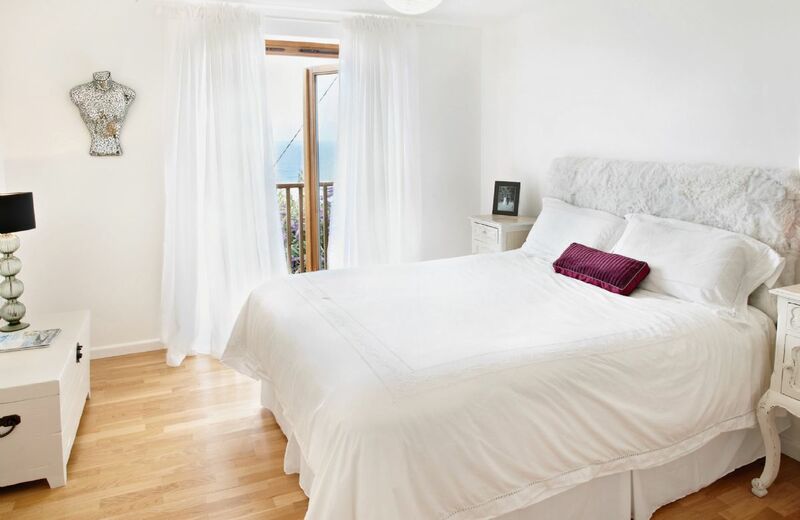 Three bedrooms, one en-suite bathroom and two en-suite shower rooms. South facing garden with terrace. Limited on-site parking (see property layout). Baby welcome, please bring your own travel cot / high chair. Minimum of a four night stay. Stunning panoramic views of the sea. Electric hob and oven, microwave, dishwasher, fridge. Small work top freezer, washing machine and tumble dryer in external utility. TV with Feeview, digital radio, iPod. Telephone accepts incoming calls with the facility for outgoing emergency calls. External utility room to store wet suits and surf boards. A five minute walk to the beach which is a mix of sand and shingle. 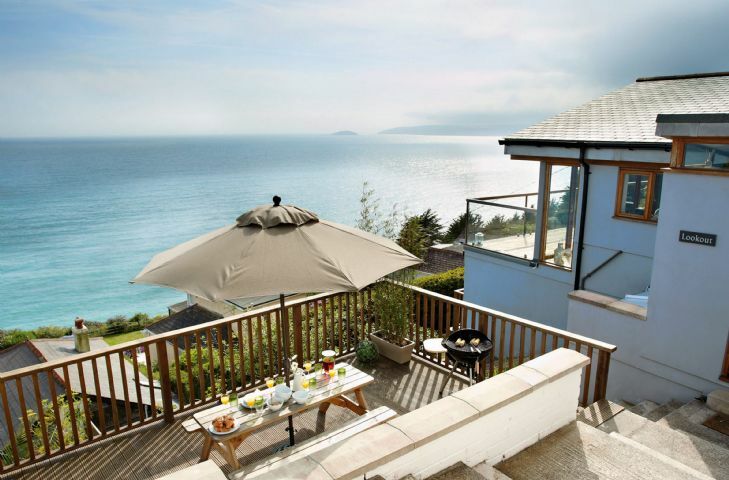 Visit Looe, a popular town on both banks of the river Looe. The Eden Project is approximately a 45-minute drive from the property. They have special events throughout the year. The Monkey Sanctuary is a favourite for children and parents alike, situated a short distance from Downderry.